The post below this one has a forecast from the AccuWeather fine-scale storm model. 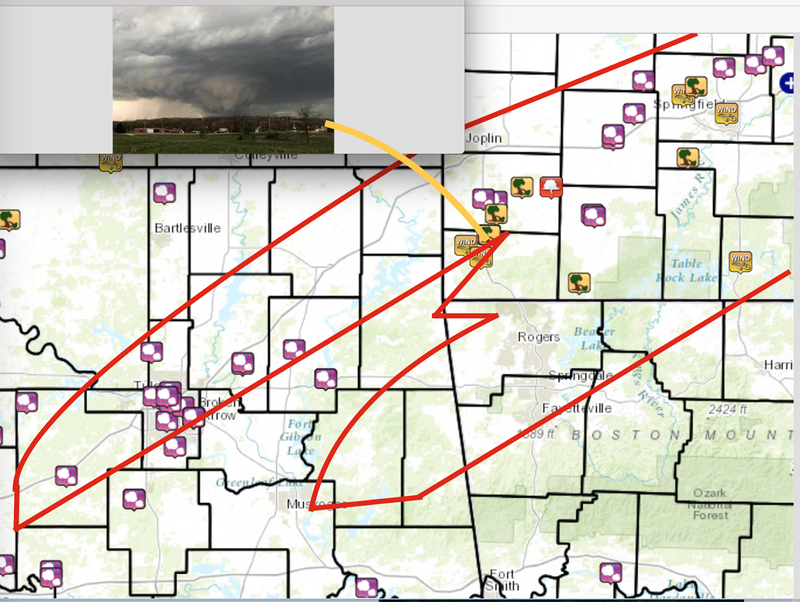 I posted it on the blog this afternoon because I was convinced there was going to be large hail and, perhaps, a tornado or two along the path outlined. I wrote that if you were along or just south of the yellow line (I actually meant orange but let's go with what I incorrectly wrote) you should be prepared. At AccuWeather, we define "just south" as 15 miles. 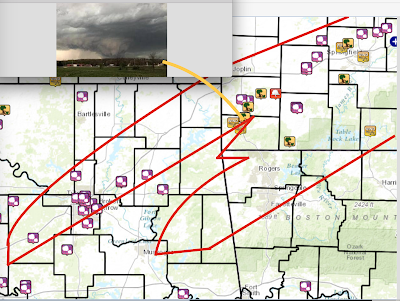 So, I've drawn up a very rough plot of the forecast versus what actually occurred. The inset photo is from Facebook and shows the damaging tornado that occurred at Goodman, MO. The funnel cloud symbol just to the northeast may have been the same tornado. I think you'll agree the model did a very good job of showing where the most concentrated area of severe weather reports would occur, especially in the yellow areas. Two notes: One, there were many reports of high winds in southern Kansas that are not shown on this map. We know from experience the model does not handle that type of situation well. The second note is that this type of model needs to be interpreted by an experienced meteorologist given the quirks like the one mentioned above.